Cities Connection Project | APARTMENT HOUSE. PREGASSONA. The project concerns a small apartment house. A quite usual program that we tried to develop starting from its apparent banality. The structure of the building is the simplest one could imagine: an eight pillars crown with two bearing cores in the middle. The project poetic is ex- pressed through its essentiality, such as represented in the structural model picture. 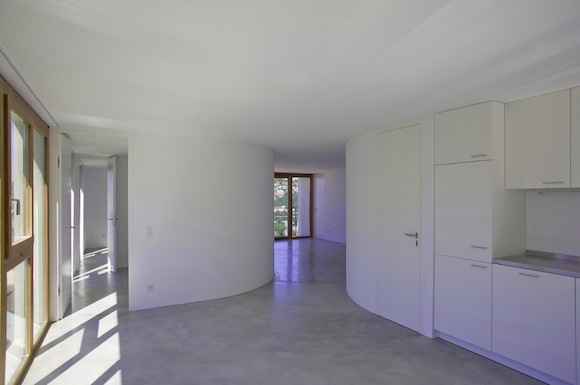 The apartments floor plan follows the structural parti- tion, alternating confined spaces (sleeping rooms, ser- vices and vertical circulations) and more fluid spaces (sit- ting rooms and kitchens). The multiple exposure model picture interprets the central symmetry of the floor plan. The vertical structure is continuous without variations along the four floors of the building. At the entrance level the structure is the only visible element. Instead at the lower floor and at the two upper floors it is occupied by the apartments partitions. On every floor, each couple of apartments can be com- bined in a unique living entity by eliminating the dia- phragm between staircase and elevator. 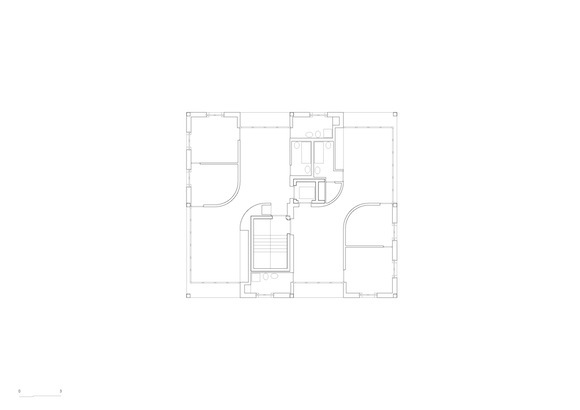 The apartments floor plan is traversed by a diagonal open space that amplifies their dimension. This space, directly accessible from the staircase and the elevator, leads to all second- ary rooms.